Considered to be the largest betting company in the United Kingdom, Betfair is both a sportsbook and a betting exchange. The bookmaker launched its business in 2000 and its sportsbook in 2012. It has kept on growing ever since. It is listed on the London Stock Exchange and operates under a licence in the UK and another one in Malta. This Betfair review will focus on the sportsbook of the online betting provider. Various features of the bookmaker will be analysed to give you an idea about the selection of sports, the customer service, the Betfair welcome bonus and other offers, as well as to test the legitimacy of this British bookie. Betfair was the first bookie ever to offer cash outs. It allows you to close a bet before the match is over. At Betfair you can place live bets on more than 20 different sports. Start now! Betfair is based in Hammersmith in West London, United Kingdom and Clonskeagh, Dublin. It was founded in 1999 and launched on the market in 2000. At first, it started out as a betting exchange, which means that the customers themselves are the bookmakers offering odds on sports events. A few years ago, it added a sportsbook with fixed odds to its business portfolio. In 2016, it merged with Paddy Power, creating Paddy Power Betfair. Together they have over 7,000 employees worldwide. Betfair sports is definitely a reliable business since it is licensed by the Gambling Authorities of Malta. In addition, for customers in Great Britain, is also has a UK license from the Gambling Commission. The present Betfair bonus comes in the form of free bets. New customers residing in the UK and the Republic of Ireland can get up to £100 in free bets when they sign up with the bookmaker. In order to qualify for this interesting Betfair bonus, you must place 5 bets of at least £10 at minimum odds of 1/2 (1.5). To obtain the full bonus amount, this process has to be repeated five times. According to our Betfair review, this is quite an attractive bonus offer, although it is a bit more complicated than at other sportsbooks. There is no minimum first deposit amount since this Betfair offer is valid for 30 days after account opening. However, you must enter the Betfair promo code when registering at the bookmaker in order to be able to use the offer later on. Here are step-by-step instructions on how to activate your Betfair free bet bonus. According to our Betfair review, this process is relatively simple, yet you should follow the steps in order to avoid making mistakes. Step 1 – Registration: Go the Betfair homepage and click on “Join now” button at the top right. You will be redirected to the registration form that you fill in with personal and contact details, as well as your username, password, security question, currency to be used, etc. This is also where you have the option to enter your Betfair new customer promo code: ZBBC01! Step 2 – Making a deposit: No deposit is required upon signing up. However, if you want to start betting right away click on the “Deposit” tab, choose your method of payment and fill in the account information. Note: Deposits made with Moneybookers or Neteller are not eligible for the Betfair bonus offer. To be able to fulfil the requirements, you should deposit a minimum of 50 GBP. Step 3 – Fulfil the promo code conditions: Place 5 single bets of £10 (or more) on the Sportsbook each at min odds 1/2 (1.5). Keep in mind that bets placed on the same selection or market, or on multiple bets, do not qualify for this promotion. You have 30 days to place and settle qualifying bets after opening your account. Step 4 – Use the free bet: Once your 5 qualifying bets have been settled, you will receive a £20 free bet. The process can be repeated up to 5 times. In order to obtain the max bonus of £100, you must repeat this process 5 times (5 x £20 free bets). Free bets should be in your betting account within 24 hours and they are valid for 30 days. This Betfair review noticed that both new and existing customers have the possibility to benefit from other interesting Betfair offers. As at other bookmakers, this sportsbook also guarantees “Best Odds”. This means that no matter what the price was when the customer placed their bets, the bookmaker will settle them at the Starting Price (SP) if is bigger. This offer is valid for the UK and Irish horse race markets as well as greyhound races. Moreover, customers are also given the chance to use the “Acca Boost”. In other words, this is a Betfair promotion which applies to accumulator bets, so trebles or above. Depending on the number of legs in the ACCA, your bonus percentage will increase. This offer is applicable for all Betfair sports and markets. With regards to the sports portfolio, the Betfair review was surprised to see such a large range of sports and events. Besides the traditional sports like football, horse and greyhound races, tennis, ice hockey and rugby, there is also a number of exotics such as darts, politics and happenings in the high society. Not only is the variety wide, but its depth is also impressive. There are typical 1×2 bets, long-term bets. In fact, around 100 special bets are offered here. Like at other bookmakers, Betfair also offers e-sports. There is a good range of games, for instance, League of Legends is present, but the bookmaker is only offering bets on the more major eSports tournaments. When it comes to live streaming, Betfair covers almost every race in the UK. 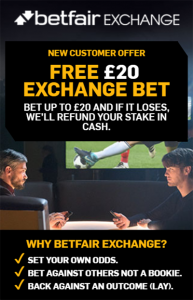 Since Betfair is both a sportsbook and a betting exchange, the Betfair review noticed that the better, if not outstanding, odds can be found on the Betfair exchange. It is said that the odds there are around 20% better than anywhere else. This is why the Betfair sportsbook seems to offer odds that are rather average when compared to other bookmakers. Nevertheless, Betfair now has a “Price Rush” feature, which automatically checks the fixed odds offered by the sportsbook against the best odds available on the Betfair Exchange. Customers are then given the exchange odds if they are better. Our Betfair review found that Betfair is a good place if you are looking for a large variety of sports and events to bet on, even though it may lack some of the attractiveness of top sportsbooks. The regular betting odds might not be the best on the market, but many of them are guaranteed, especially for the traditional British sports. In addition, the recently added “Price Rush” feature lets punters take advantage of the betting exchange odds. Betfair is a serious online betting provider that is licensed in Malta and the UK. 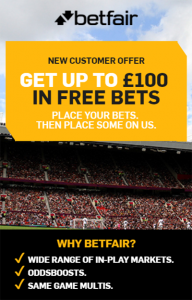 The Betfair welcome offer up to 100 GBP is fair and attractive. For all of those reasons, the Betfair review is definitely positive. Like most sportsbooks on the market, Betfair offers various payment methods for making deposits and withdrawals. Besides the usual debit and credit cards (MasterCard, VISA, etc. ), the e-wallets Neteller, Skrill, ClickandBuy and PayPal are available. Bank transfers are also possible. Most deposits options are free, but for credit cards, PayPal and bank transfer fees from 1.5 to 1.5 % are charged. The minimum deposit amounts vary between 5 and 12 GBP depending on the chosen method of payment. Step 1 – Go to the banking section of your account: Once you are logged in, click on the “Deposit” button at the top right of the homepage. All payment methods will be displayed. Step 2 – Select the desired payment method: Select one of the deposit options. Enter the amount, the currency and your password. Step 3 – Transact: Depending on the selected method, you might have to enter further details (eg. Security number of a credit card). When everything is filled out, click on deposit. Your funds should appear in your account soon afterwards. According to this Betfair review, the bookmaker has a “closed loop policy” which means that you need to withdraw funds from the same payment source used for deposits. All payment options for withdrawals are free of charge. Payouts, in general, are quick, within a few hours for e-wallets and between one to five days for bank transfers. The customer service at Betfair is available in English and offers most of the usual channels. From the UK, customers can reach the support at 0344 871 0000 and in Ireland, the number to call is 1800 944 000. Outside of the UK, please dial 0044 203 059 8888. According to the Betfair website, the response time is 30 seconds. The same applies to the live chat. Unfortunately, our Betfair review finds that the 10 am to 10 pm availability of this feature is lacking. Other sportsbooks offer live chat 24/7. This Betfair review was unable to find an e-mail address on the contact page of the sportsbook. However, the customer service can be reached via Twitter @BetfairCS. Once again, this option is only available from 8 am to 11 pm. A number of customers are not satisfied with the quality of the answers. The same thing applies to their FAQs. The answers are too short and not really comprehensive. As mentioned earlier, Betfair is present on Twitter, where you can not only contact the customer service but also read some sports betting news. On Facebook, customers have the possibility to win free bets of up to £50 from time to time, for example by predicting the score of a match. In addition, videos and sports news are regularly posted. Reliable or scam: How safe is Betfair? Our Betfair review found that the sportsbook is professional. Even though the terms and conditions could be clearer, this is no indication of a scam. Since Betfair is a top bookmaker in Great Britain, you can rest assured that their reputation is important to them, so the betting environment is safe. The betting provider currently operates with licenses from Malta and the UK. As such, the Gambling Commissions regularly audit the bookmaker. Moreover, the site is encrypted via Kaspersky and works with Norton Secured by VeriSign, thus ensuring that punters are protected from data theft. Yes, you do. The Betfair promo code is ZBBC01. It must be entered when you register or else you will lose the possibility of using it. You then have 30 days to make use of it. What deposit methods are available at Betfair? There are a number of alternatives for depositing money at Betfair. Deposit methods include debit and credit cards, various e-wallets (Neteller, Skrill, PayPal), bank transfers and cheques. The deposits can be processed instantly or take up to 10 banking days depending on the selected option. By the way, no fees are charged for withdrawals using the same methods as for depositing. Is there a Betfair App? Yes, there is. If you wish to be able to place bets while on the go, then you should download the Betfair sportsbook app from the Apple App Store or get the Android App directly from the Betfair website. Why does Betfair need to verify my identity? Before making any withdrawals, your identity needs to be verified. There are two reasons for this. First of all, you can only be a Betfair customer if you are at least 18 years old. In addition, the sportsbook must make sure that the payout is going to the right person. For British punters, it is important to know that Betfair is regulated by the UK Gambling Commission. In addition, the online betting business is licensed by the Gaming Authorities of Malta, which is known to be extremely strict when granting licenses. In addition, Betfair has licenses in Australia, Bulgaria, Denmark, Gibraltar, Italy, Malta, Spain and the USA. 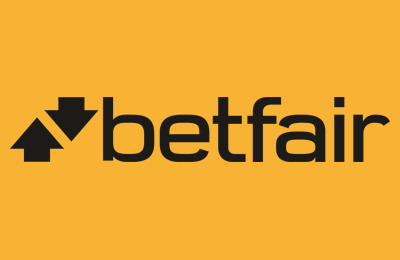 This enables Betfair to give customers the possibility to bet and trade on markets at both Betfair Exchange and Betfair Sportsbook in over 40 countries.